Friends of Forth Valley Royal Hospital, hopes to meet and greet many visitors when it hosts a sale of work on Wednesday, April 10. Representatives of the group will be at the atrium of the Larbert hospital selling gifts, home baking and much more. So, if your are vising friends, neighbours or relations or have an appointment there yourself why not go along and make a contribution to the fundrasising bid. 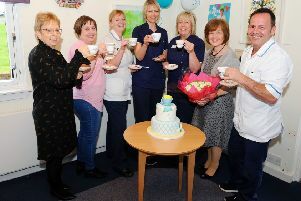 All the money collected goes to fund projects in Forth Valley Royal Hospital and the surrounding community hospitals. It contributes towards such things as discharge packs which are a few essential food items given to patients to help them settle in at home after a stay in hospital. If you would like to know more about the Friends or would like to join call 07423 561056 or email www.info@friendsfvrh.org and check out their website at www.friendsfvrh.org. Friends of Forth Valley Hospital annual general meeting will be held on Tuesday, May 14.